PLUS The Society (Secretary's report, the Library) Buckinghamshire County Museum, Centre for Buckinghamshire Studies, County Archaeological Service, Conservation and Archaeology in Milton Keynes. 324 pages, with many illustrations in colour. 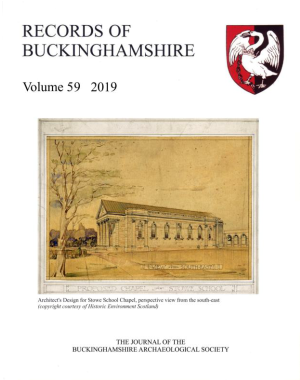 Members of the society receive copies of Records volume 59 free as part of their membership – so why not JOIN THE SOCIETY? Price to non-members: £15.00, plus £3.50 for post and packing. TO GET YOUR COPY: print and complete our Recent Publications Order Form and return it to us by post.